Roughly 40 minutes drive – or longer, if you continue to stop and soak in the amazing vistas across the Adriatic to Greece along the coastal road – is the lovely village of Otranto. It’s smaller than Lecce, which means that it’s smaller than many typically-viewed tourist ventures, but that doesn’t mean you shouldn’t go. In fact, you must go. Put it on your bucket list! 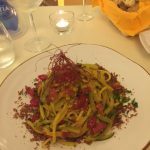 Otranto has a vibrant centro storico and incredible food too! 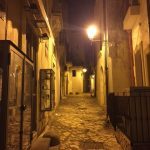 As I wondered around Otranto – more specifically, the centro storico and the immediate surroundings outside the city walls – it became very apparent that whatever sort of lodging you might be searching for, you will find it: B&Bs, 2-star, 4-star, and even 5-star are all available with just a bit of searching. I chose to stay at the Basiliani Resort and Spa (http://www.basilianiresort.com/en) which is, in all honestly, about a 10 minute walk from the centro storico. I was looking for a restful place where I could take some sun, read a lot, and just shut down from the work environment and I found it here. The staff at the Basiliani were fantastic, and the rooms, although minimalist in décor, were large, each had its own balcony of some sort, and an aesthetic that I have come to expect from Italian beach “resorts”. And so you know, the pool is huge! There are, however, a few things to be prepared for before booking: the breakfast is horrible but as long as you don’t depend on that as your only sustenance, you’ll be fine . (And hint: don’t drink the coffee from the machine but ask the staff for a cappuccino and they’ll make a decent coffee.) And they tend to “charge” for things that, at least to me, seem like they should have been included but, as long as you are prepared, you’ll be fine. If you want something closer to the centre, I would try the Hotel Palazzo Papaleo (http://www.hotelpalazzopapaleo.com/). I seriously considered this hotel for my trip but because the Basiliani had a pool, and the Palazzo didn’t, well… The hotel looks stunning and it is centrally located within the city walls of the centro storico. I would go here in the non-sun-worshiper months! Oh my god. 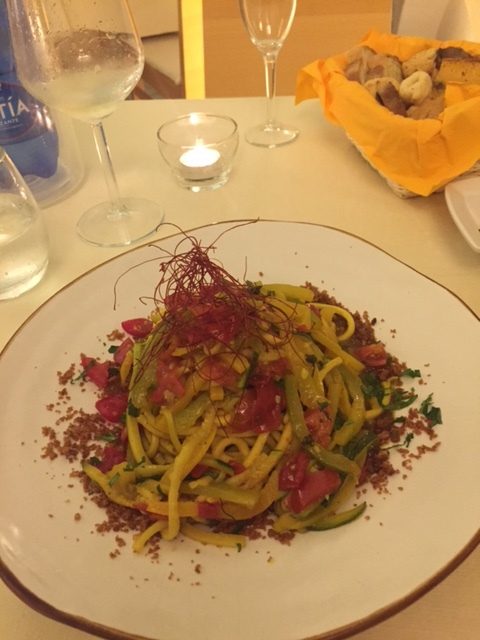 The food in Otranto is outstanding and I would have stayed here longer to go back to a few places and to find more! 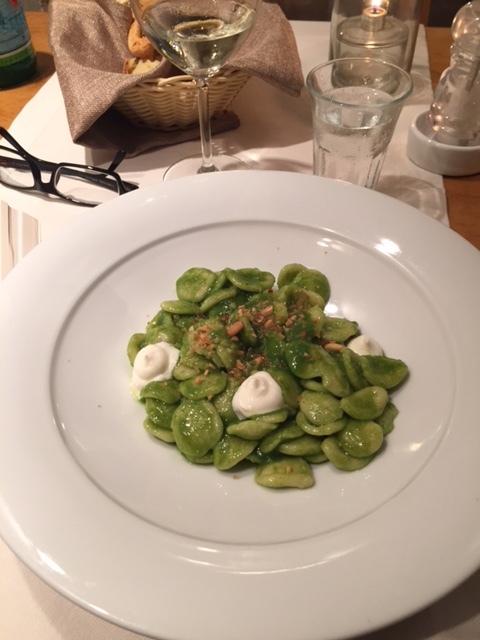 If I only had one night in Otranto, I would have a very tough time deciding where to dine. Ultimately, I would choose L’Altro Baffo Ristorante (http://www.laltrobaffo.com/). Reservations are imperative: they literally have a “velvet rope” preventing people from just walking so that you wait for them to approach you. But it is worth it! The wine list is impressive and the pours eye-boggling (and for next to nothing!). And the food outstanding! I would say that the food is more along the nouvo Italiano sort but it was still fresh, simple, and so incredibly flavourful: where do we get our tomatoes in the US?! 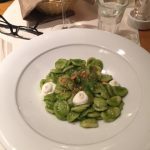 On my second night – because I would stay a second night just to eat here – I would run to Peccato di Vino (http://www.peccatodivino.com/). I say run for two very important reasons, one of which is that they don’t take reservations. I arrived shortly after opening and left over 1.5 hours later, never feeling rushed, especially when, upon leaving, I saw the throngs of people waiting to be seated! And the other reason to run here, is the food is just that outstanding and the head of the house, or the owner, I’m not sure, was so knowledgeable about wines, and what to try, that I could have stayed there forever if only my liver could have held up (and the people outside wouldn’t have shot me!) 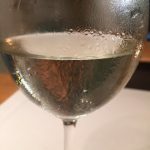 And just in case you really only have 1 night in Otranto, perhaps you could consider lunch at Peccato di Vino and dinner at L’Altro Baffo: you only live once right?! The sites of Otranto are found in just walking. Your guidebooks and websites will tell you the things that you must see, but the things that you want to see are those things that you find where your feet take you. Whatever you do, please don’t miss the Cathedral and the Chiesa San Pietro. The Cathedral will blow your mind with the mosaic floor, much of which you can’t see up close in order to protect it, but enough of it that you can see how much love and respect went in to its creation. 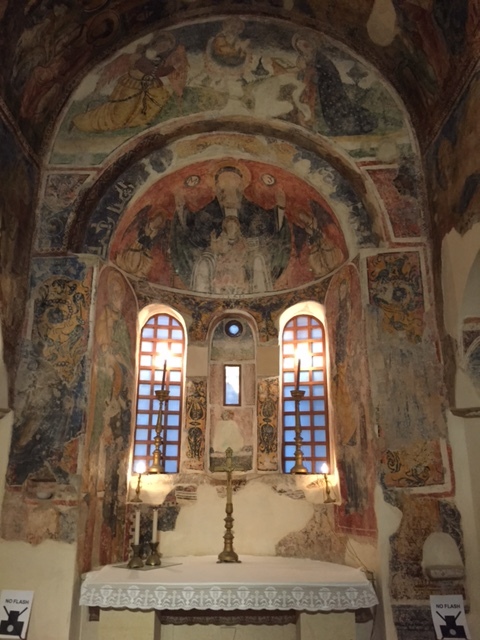 And the Chiesa di San Pietro, the tiny little church in a tiny little piazza has some of the most stunning byzantine artifacts I have ever seen. 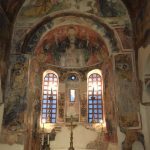 I literally could have stayed there for an hour, if there was room in the little church, looking at every aspect of this wonderful craftsmanship. 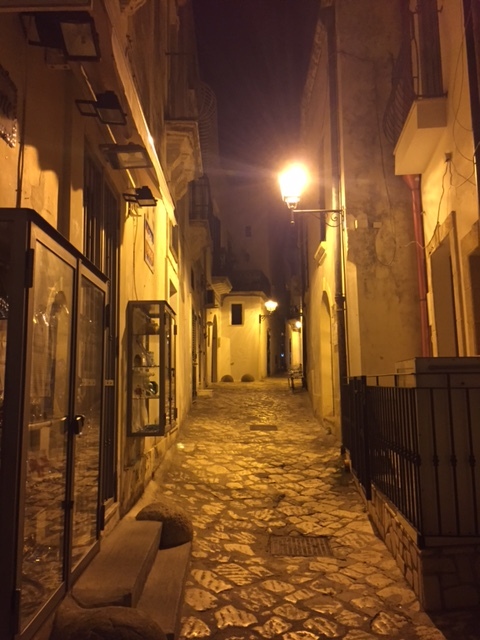 Otranto may not be for everyone as there really isn’t a lot to do other than to go to the beach or rest at a pool until night falls and you begin your evening with a passeggiata, and perhaps a drink at any of the many cocktail bars popping up around Puglia, and then dinner, and another post-meal stroll. 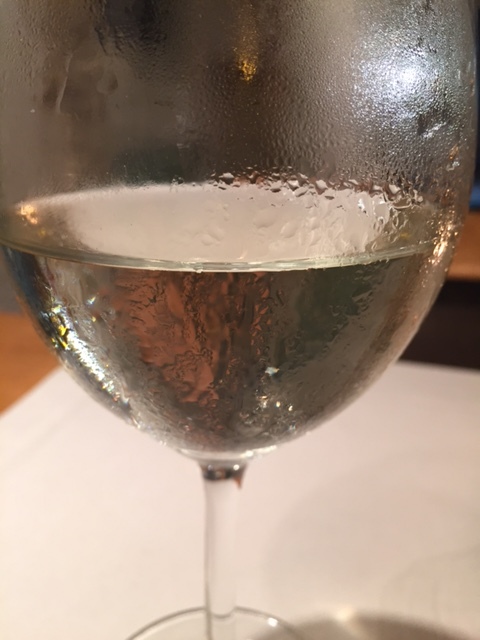 It’s the way life should be, if you ask me: relaxing, with friends, and good food, and good wine, and a true respect for that which has preceded us. I’ll be back… I’ll hope you’ll follow. This entry was posted in Otranto, Puglia and tagged Adriatic, antiques, Apulia, castle, cathedral, Chiesa San Pietro, greece, passeggiata, pasta, Puglia, Sorrento, vino. Bookmark the permalink.